What Were The Log’s Top 10 Stories of 2012? The year 2012 was an eventful one for Southern California boaters — and The Log Newspaper’s top stories of the year detailed many changes to come in 2013. In the new year, boaters can expect to see changes in the California Department of Boating and Waterways, which will soon operate as a division of the Department of Parks and Recreation. There will be major fee increases for the use of Newport Harbor tidelands by boat-owning homeowners and boating business owners alike. And there will be continued interest in Mexico’s stepped-up regulation of U.S. boaters who fish in Mexican waters near the border. The past year included some eye-popping events, such as a minivan going overboard off the Balboa ferry and a planned 18-minute Fourth of July fireworks show turning into a fiery 15-second blast on San Diego Bay. There was a major bust of an outboard engine theft ring in Long Beach Harbor. And a Los Angeles Harbor marina operator was evicted — along with more than 50 surprised boaters who had been slip holders. NEWPORT BEACH (Jan. 20) — Friday the 13th didn’t start off very well for a family on vacation in Newport Harbor, as their minivan ride aboard the famous Balboa Island Ferry turned into more of an on-the-water experience than they had anticipated. SAN DIEGO (March 30) — As news spread earlier this year on a new documentation law requiring anglers to purchase a visa to fish in Mexican waters, confusion spread about exactly what kind of paperwork was needed, what the cost would be and exactly where anglers would need to go to obtain one. WILMINGTON (April 13) — Boat owners with slips at Wilmington’s Colonial Yacht Anchorage have been on the move since finding out that the marina’s owners were evicted from the Port of Los Angeles property effective March 1. SACRAMENTO (July 6) — With the passing of a July 3 deadline for the California Legislature to vote down Gov. Jerry Brown’s Government Reorganization Plan #2, the California Department of Boating and Waterways was effectively reduced to a division of the Department of Parks and Recreation. SAN DIEGO (July 6) — As the Navy prepares to replace its aging fuel pier at Naval Base Point Loma, San Diego Bay’s longstanding bait barge will have to move out of harm’s way. However, finding a temporary location that all harbor users can agree on has been a complicated matter, so far. 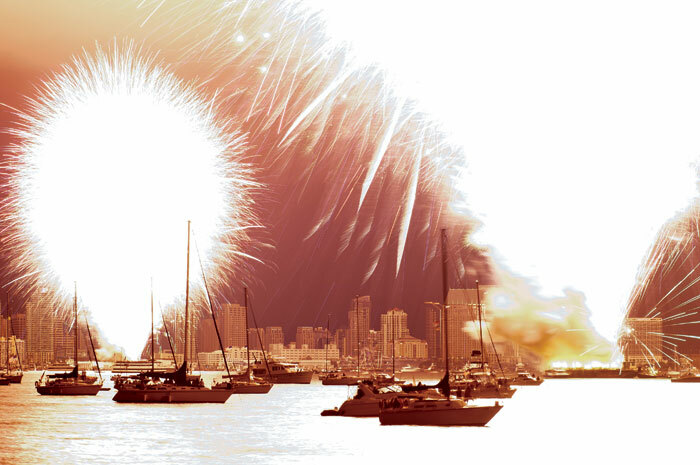 SAN DIEGO (July 20) — San Diego Bay’s 12th annual Big Bay Boom fireworks show was supposed to be louder and more intense than any in years’ past, but turning the entire show into one giant 15-second pyrotechnic finale was not in the plans. LONG BEACH (Oct. 12) — Boat owners in Long Beach’s Shoreline Marina can rest a bit easier following the break-up of an elaborate crime ring targeting outboard engines on sailboats and RIBs in the harbor, police reported. DANA POINT (Nov. 23) — The Dana Point City Council has approved new rules for its free offshore anchorage area off Doheny State Beach, placing a 72-hour time limit on vessels anchored there. NEWPORT BEACH (Nov. 23) — After ending its Oct. 23 meeting with a rent increase for commercial marina owners in Newport Harbor, the Newport Beach City Council started off its Nov. 13 meeting reconsidering its decision, agreeing to lessen the increase by 2.5 percent, while tacking on additional fee increases for many other harbor businesses. NEWPORT BEACH (Dec. 21) — In the last meeting held at the old City Council chambers, Newport Beach City Council members voted 5-1 in favor of increasing residential dock fees in Newport Harbor, with Councilwoman Leslie Daigle casting the lone dissenting vote.